How to start a Single Meditation? How to begin a meditation from the series? How to use Bell for my meditation? How to play the meditation/relax music? 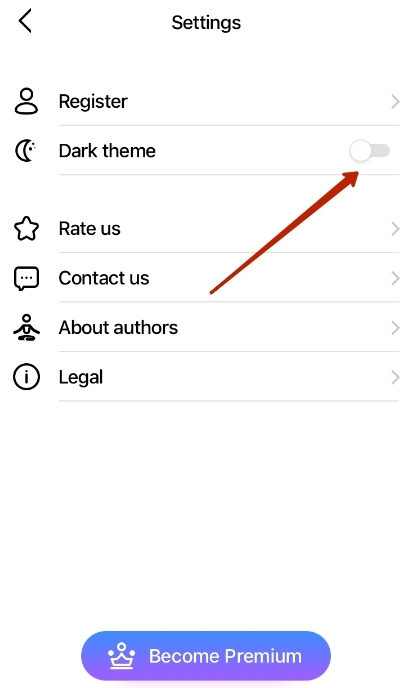 How do I choose the app theme to Light? How to view meditations I already listened to? How do I find the list of meditations that were added to Favorites? Why do I need to add a reminder? 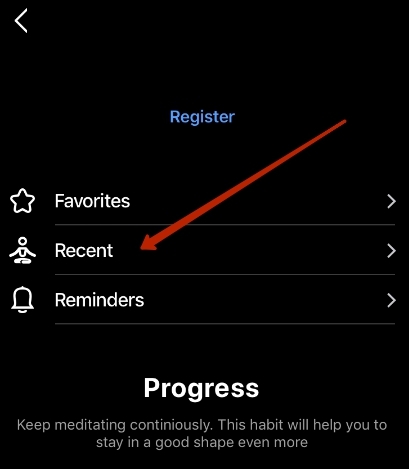 How to add a meditation reminder? How to change the sound effects or the theme while meditating? How to review my stats and progress? Why do I need to create a Nimbus Mind account and how is it done? For you - from here you can quickly go to a meditation depending on your current state of mind. 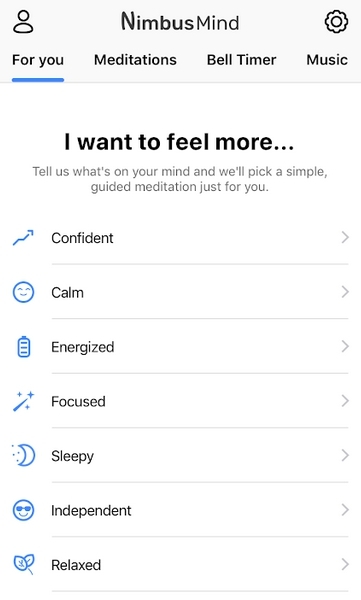 The smart service will help you choose just the right meditation :). Meditations - here you can choose meditations on various topics. Single meditations, as well as series, are available. 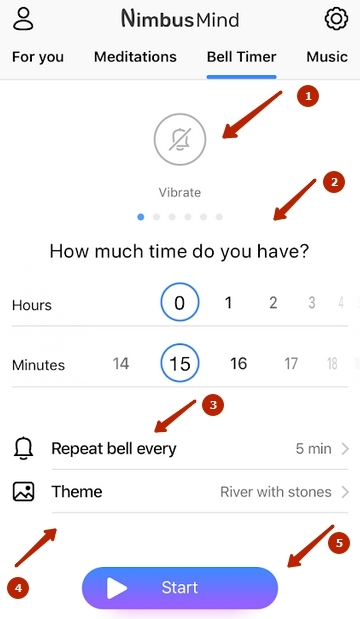 Bell Timer - a timer for meditating on your own. 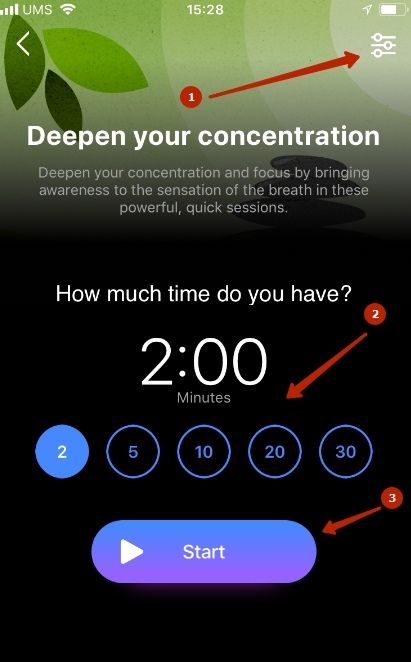 You can choose meditation time, as well as time periods over which the timer will sound. Music - contains a collection of music for relaxation, meditation, sleep improvement etc. Then you just need to press Start for the meditation to begin (3). You can leave your meditation any moment, but we strongly recommend against it, because that will render your meditation ineffective. Also, while meditating, you can disable the visual theme and the sound effects. Select the series that you like and tap on it. Then you will be able to select a visual theme and sound background you like for your meditation. Then, tap on the first meditation on the list to begin playing it. Important! For the meditations from series to be more effective, you must listen to them consecutively. You cannot listen for a second day or fifth day after you do a third. - select visual theme and sound background you want during your meditation (4). Select Music, then select the theme you want and tap on Start. Tap on Settings, then press Change theme. Tap on My account and select Recent. Tap on My account and select Favorites. It's best to meditate every day, and it's highly recommended to meditate at the same time. 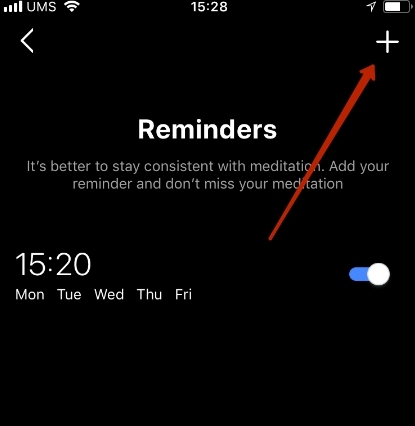 Therefore, we suggest setting reminders for specific times; the app will then remind you that you need to meditate just a bit. Tap on the account icon and select Reminders. In the window that appears press +. Then set reminder time (1) and interval (e.g. you can set the reminder to sound on Monday, Wednesday and Friday) (2). 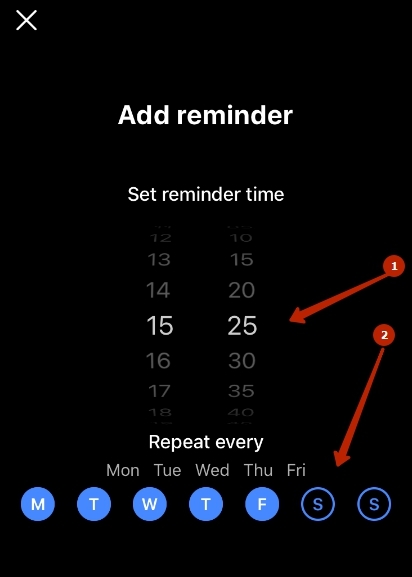 You can set several different reminders for different times and different days. You can also delete any reminders any time. Tap on the Settings icon. In the window that appears you can set the necessary theme by simply tapping on it. If it hasn't been downloaded yet, it will be. If you need to change sound effects, tap on the same screen on the Sound effects icon. In the window that appears, you will be able to change the effects using sliders. Tap on My account. In the window that opens you can view your current statistics by days and weeks: how many sessions you listened to and how long it took. By creating an account, you'll be able to synchronize your results, favorites and meditations you already listened to between various devices. To create an account, tap on the My Account icon and press Register.